Coming off the heels of the sold out 4th Annual St. Patrick’s Day Clash which has amassed over 225,000 online views, Murphys Boxing is proud to announce the creation of the Warrior’s Code Award to celebrate the achievements of New England’s most legendary boxers. The award’s first recipients will be 2019 International Boxing Hall of Fame inductee, Tony DeMarco and one of Massachusetts’ most decorated amateur boxers, Mike D’Ampolo. Both fighters will be presented with their awards next Friday, March 29th at the Murphys Boxing event at Memorial Hall in Melrose, Massachusetts. At 87 years old, Tony DeMarco holds the distinction of being boxing’s oldest living world champion and has been a beloved figure in the Boston sports world for over half a century. Known as ‘Nardo’, the Boston fighter of Italian descent, turned pro unbelievably just a few years after the end of World War II. In a 14 year career, DeMarco went 52-12-1 while fighting during boxing’s golden age. His legendary battles with Hall of Famers like Carmen Basilio and Kid Gavilin made DeMarco a star and he won the welterweight world title in 1955 against Johnny Saxton at the original Boston Garden in a fight that was voted one of Boston’s Top 10 Sports Moments. 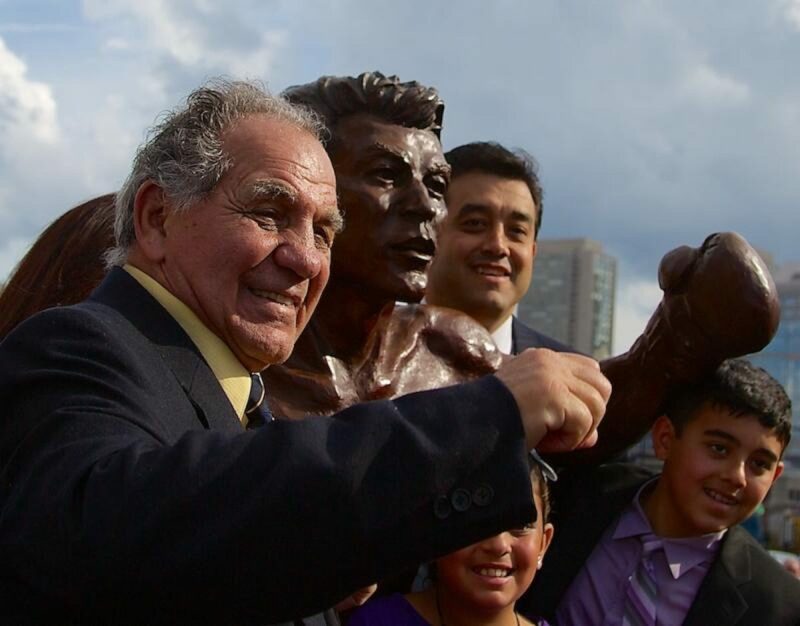 DeMarco, who still can be found ringside at Murphys Boxing events and whose statue resides in Boston’s North End where he still lives, will receive the long overdue honor of joining the International Boxing Hall of Fame as a 2019 inductee this June. “Murphys Boxing has always been very welcoming to me and my family.”, explains DeMarco. Joining DeMarco will be Melrose’s own, Mike D’Ampolo, who is considered one of the most successful amateurs ever to come out of the state of Massachusetts. D’Ampolo was a New England Golden Gloves Champion, a 3x New England AAU Champ, a 2x Eastern Regional Champion and participated in the 1984 Olympic Trials barely missing a spot on the legendary 1984 USA Olympic Team with his weight class ultimately being represented by none other than Evander Holyfield. On advice from his father, D’Ampolo made the decision to not enter the professional ranks and went onto become a successful businessman with his company, M&L Transit Systems based out of his hometown of Melrose, Massachusetts. “I’m humbled. Back when we were fighting, there wasn’t much recognition or credit given to amateurs.”, says D’Ampolo. Murphys Boxing founder, Ken Casey explains the promotion’s decision to name Demarco and D’Ampolo as the first two recipients of the award named after one of the Dropkick Murphy’s signature songs, “The Warrior’s Code” which is a tribute to another New England boxing hero, Micky Ward. Quincy’s Ryan Kielczweski (29-4, 11 KOs) vs. Nick Otieno (31-15, 13 KOs). Holbrook’s Mike Ohan Jr. (8-0, 5 KOs) vs. Shaka Moore (12-23-3, 2 KOs). South Boston’s Joe Farina (5-1, 3 KOs) vs. Carlos Galindo (1-8). Mansfield’s James Perella (1-0, 1 KO) vs. Andre Belcarris (0-5). Medford’s Joe Gagliardi Jr. (1-0) vs. TBA. Venezeula’s Luis Arcon (5-0, 5 KOs) vs. Springfield’s Zack Ramsey (8-6, 4 KOs). Ireland’s Craig O’Brien (9-1, 1 KO) vs. Brockton’s Antonio Fernandez (9-35-4).